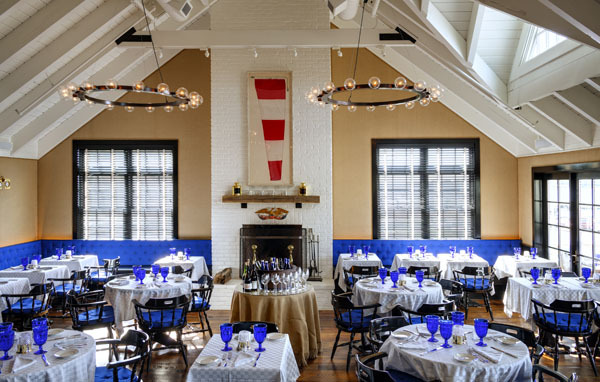 To savor every last bite of summer, Baron’s Cove Sag Harbor, whipped up quite the feast in its Hamptons end-of-season fête. The newly renovated harborfront resort takes its location very seriously, as it transformed its prime outdoor patio into a daytime barbeque hot-spot for Rob Shawger, the leader of the Salty Rinse BBQ team, and Baron’s Cove acclaimed chef Matty Boudreau. The duo showed off their culinary talents on Texas style brisket, glazed baby back ribs, pulled pork, Montauk Brewery beer can chicken with all the fixings, and not to mention live music. 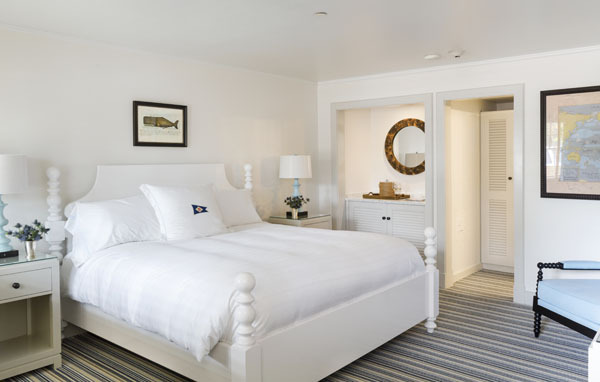 Conveniently overlooking the Sag Harbor Cove Yacht Club and a ten-minute stroll from Sag Harbor’s Main Street, almost everything at Baron’s Cove has a subtle hint of nautical ease in woven navy fabric. 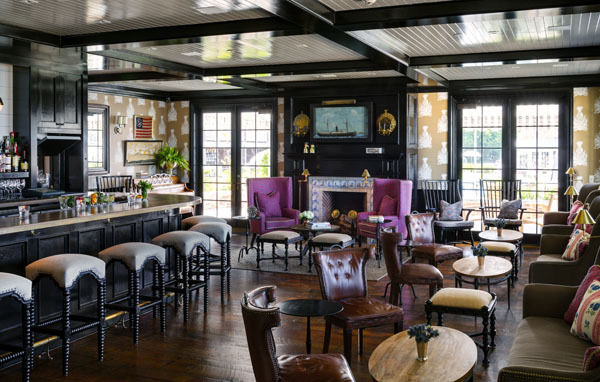 From the 67-room charming décor to the intimate seating surrounding both indoor and outdoor fireplaces in the lobby’s bar and lounge, all jibes well with the historic vibe of Sag Harbor’s whaling roots. The wall-hanging whale above the fireplace creates a nautical focal point and a conversation starter in any seating area. 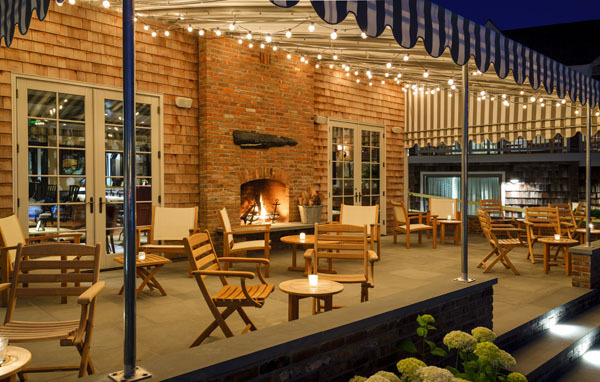 With the Hamptons International Film Festival kicking off October 5th, Baron’s Cove guests can cozy up in the outdoor patio during those late autumn days in casual rocking Adirondack chairs over beer, wine, and signature fall cocktails with a light meal, like farm stand crudité and sliders from the resort’s Harbor menu. Or, consider the second-floor dining room and outdoor terrace with panoramic views of those ruby red sunsets over the harbor any night of the week. 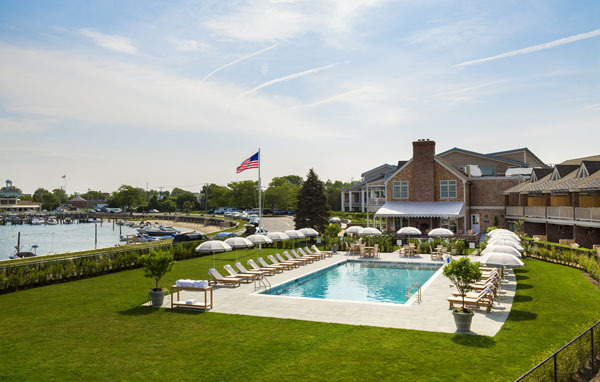 Not only does the resort boast one of the best views in the Hamptons, it provides ease of all-inclusive perks to virtually everything in the Hamptons guests from all over the world can enjoy year-round. From a harbor-facing pool, basketball and tennis courts, to complimentary bike rentals, private parking, and a selection of fun, invigorating, and relaxing wellness options like “Yo-Core,” on the front lawn for the mind and body. 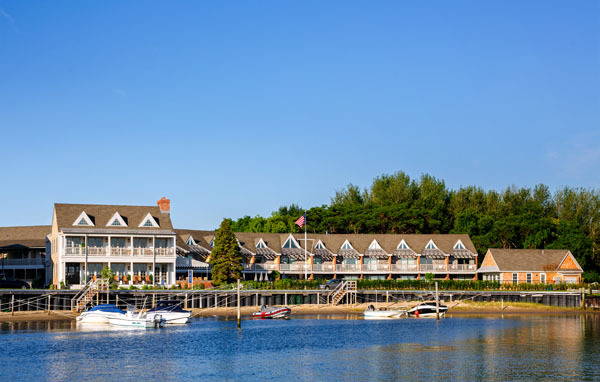 Not to mention the hotel’s complimentary beach shuttle service to one of the nearby Hamptons beaches. Still, the best part about Baron’s Cove is that it exudes the personality of a quaint local inn, within its all-American resort lifestyle. A personal favorite is the “Travels with Charley” package, where you can bring Fido along sans size limits. With so many fantastic dog walking parks and trails around, there’s no excuse for leaving your furry friend behind. 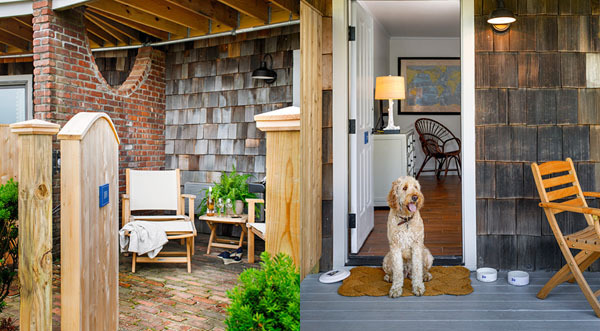 Take your pup in any one of the dog-friendly Village Garden Rooms. With maximum accessibility for the whole family, these rooms are located on the first floor with plush queen or king-size beds, complete with a Baron’s Cove Frisbee and a special dog treat. Guest village rooms, harbor suites, and lofts are turned towards either the village or harbor, are spacious and designed in cool shades of blue, gray and white, some with private terraces overlooking the water. All rooms come with a flat-screen TV and extras include bathrobes and free toiletries. But what’s most endearing is the bedding that’s monogrammed with a Baron’s Cove burgee flag. Interior designer Colleen Bashaw nailed it, so beach house chic. Baron’s Cove is located at 31 West Water Street in Sag Harbor.